This elegant Christmas card was soooo quick and easy to make! Most of the products belong to the new Year of Cheer Suite in the 2017 Holiday Catalogue and will be available from 1 September 2017 to 2 January 2018. To the black card base I adhered the snowflake trim. This is cut from the new Champagne coloured Foil Sheet using the new Swirly Snowflakes thinlits. To the other side of the card front, I adhered a piece of the gorgeous new Year of Cheer Specialty Designer Series Paper and added a piece of the Year of Cheer Specialty Washi Tape over the join. 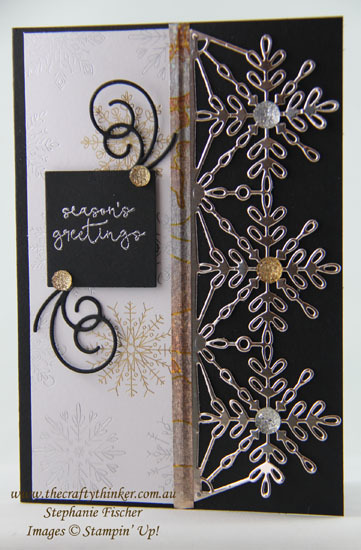 I silver heat embossed the greeting from the Cheers To The Year stamp set onto a small square of Basic Black card and added the little swirls cut with the Swirly Snowflakes thinlits. To add the final bits of bling, I used Clear and Gold Faceted Gems.